wanderlust ATLANTA: ATLANTApix: Castles in Atlanta? Are there castles in Atlanta? Drive by Oglethorpe University and you'll certainly think so, but the university was in fact designed after the alma mater of the university's namesake, the founder of Georgia, James Edward Oglethorpe. Oglethorpe University opened its doors in 1835, three years after its original charter. The cornerstone of its Peachtree Road location was laid in 1915. To honor the founder of Georgia, Oglethorpe is fashioned after Corpus Christi College, Oxford, founded in 1517. 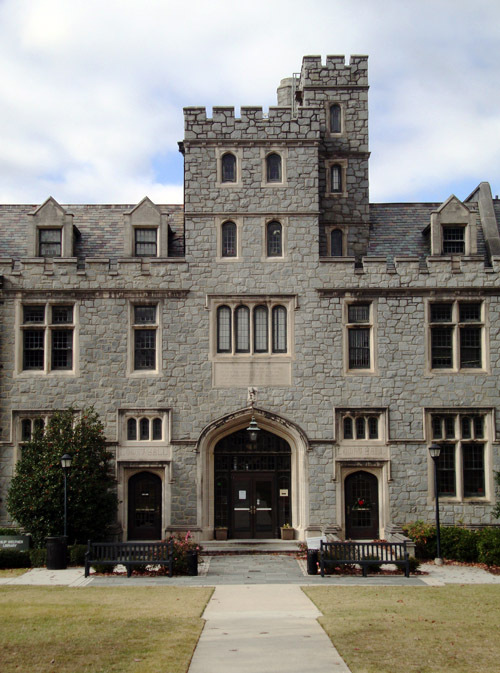 Open to the public is the Oglethorpe University Museum of Art, located in the Philip Weltner Library Building (photo). Their next exhibit, "Students Draw the Line...Against Prejudice," opens Sunday, January 16, 2001. And while I'm talking about castles in Atlanta, there's of course Rhodes Hall (built 1904), which is actually called "The Castle on Peachtree." They too offer a phenomenal tour. Oglethorpe may have the only Gothic baseball stadium. The pinkish granite of the main buildings look very special, almost ethereal, in the mornings.